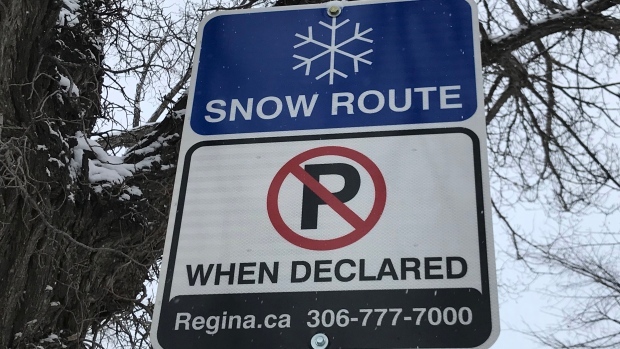 Following a weekend of snowfall, the City of Regina has declared a Snow Route parking ban, effective Tuesday morning. When a Snow Route is put into effect, on-street parking is temporarily not allowed on certain streets for a 24-hour period to allow for snow removal equipment to clear streets from curb to curb. Snow Routes in Regina are Victoria Avenue between Broad Street and Winnipeg Street, Winnipeg Street between Victoria Avenue and College Avenue, and College Avenue between Winnipeg Street and Arcola Avenue. Affected streets are also identified by blue signs with a white snowflake. The Snow Route goes into effect Tuesday at 6 a.m. and ends Wednesday that same time.